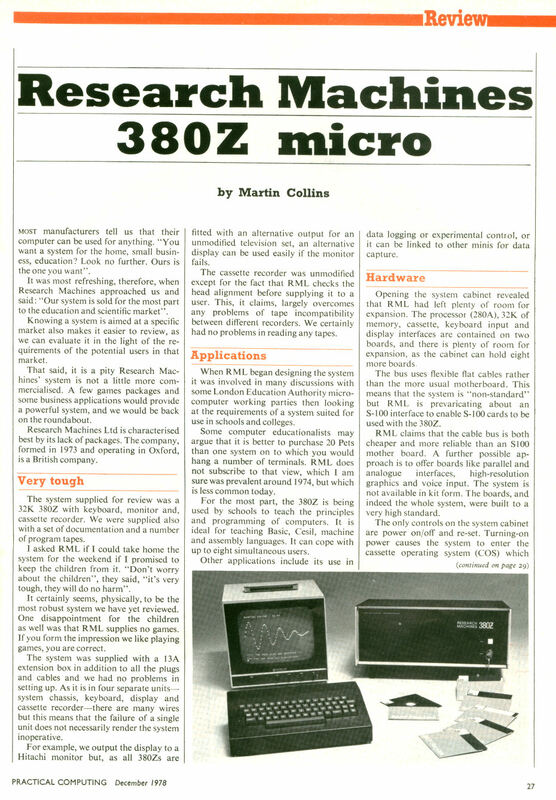 The following article appeared in the December 1978 issue of Practical Computing . Thanks to David Viner and Dan Williams for supplying the scans. Most manufacturers tell us that their computer can be used for anything. “You want a system for the home, small business, education? Look no further. Ours is the one you want”. It was most refreshing, therefore, when Research Machines approached us and said: “Our system is sold for the most part to the education and scientific market”. Knowing a system is aimed at a specific market also makes it easier to review, as we can evaluate it in the light of the requirements of the potential users in that market. That said, it is a pity Research Machines’ system is not a little more commercialised. A few games packages and some business applications would provide a powerful system, and we would be back on the roundabout. Research Machines Ltd is characterised best by its lack of packages. The company, formed in 1973 and operating in Oxford, is a British company. 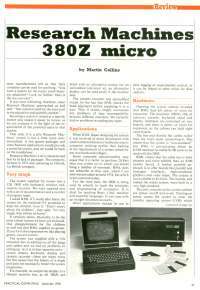 The system supplied for review was a 32K 380Z with keyboard, monitor and cassette recorder. We were supplied also with a set of documentation and a number of program tapes. I asked RML if I could take home the system for the weekend if I promised to keep the children from it. “Don’t worry about the children”, they said, “it’s very tough, they will do no harm”. It certainly seems, physically, to be the most robust system we have yet reviewed. One disappointment for the children as well was that RML supplies no games. If you form the impression we like playing games, you are correct. The system was supplied with a 13A extension box in addition to all the plugs and cables and we had no problems in setting it up. As it is in four separate units—system chassis, keyboard, display and cassette recorder—there are many wires but this means that the failure of a single unit does not necessarily render the system inoperative. For example, we output the display to a Hitachi monitor but, as all 380Zs are fitted with an alternative output for an unmodified television set, an alternative display can be used easily if the monitor fails. The cassette recorder was unmodified except for the fact that RML checks the head alignment before supplying it to a user. This, it claims, largely overcomes any problems of tape incompatibility between different recorders. We certainly had no problems in reading any tapes. 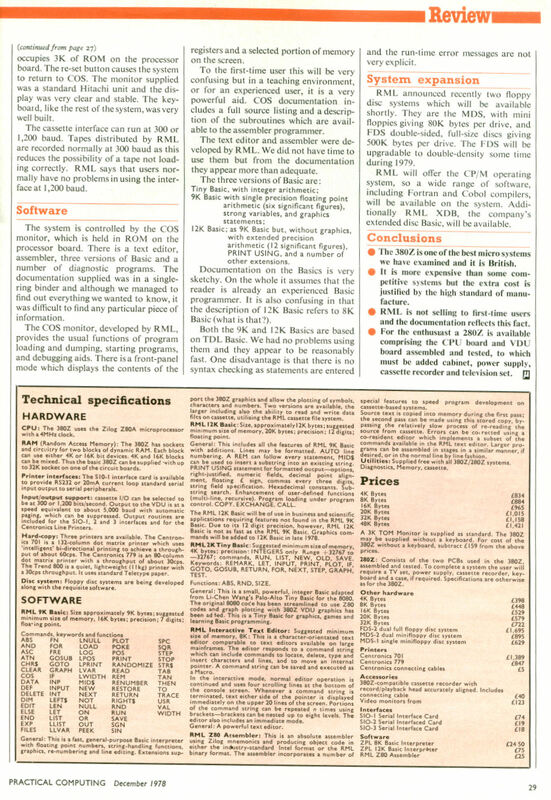 When RML began designing the system it was involved in many discussions with some London Education Authority microcomputer working parties then looking at the requirements of a system suited for use in schools and colleges. Some computer educationalists may argue that it is better to purchase 20 Pets than one system on to which you would hang a number of terminals. RML does not subscribe to that view, which I am sure was prevalent around 1974, but which is less common today. For the most part, the 380Z is being used by schools to teach the principles and programming of computers. It is ideal for teaching Basic, Cesil, machine and assembly languages. It can cope with up to eight simultaneous users. Other applications includes its use in data logging or experimental control, or it can be linked to other minis for data capture. Opening the system cabinet revealed that RML had left plenty of room for expansion. The processor (Z80A), 32K of memory, cassette, keyboard input and display interfaces are contained on two boards, and there is plenty of room for expansion, as the cabinet can hold eight more boards. The bus uses flexible flat cables rather than the more usual motherboard. This means that the system is “non-standard” but RML is prevaricating about an S-100 interface to enable S-100 cards to be used with the 380Z. RML claims that the cable bus is both cheaper and more reliable than an S100 mother board. A further possible approach is to offer boards like parallel and analogue interfaces, high-resolution graphics and voice input. The system is not available in kit form. The boards, and indeed the whole system, were built to a very high standard. The only controls on the system cabinet are power on/off and reset. Turning on power causes the system to enter the cassette operating system (COS) which occupies 3K of ROM on the processor board. The reset button causes the system to return to COS. The monitor supplied was a standard Hitachi unit and the display was very clear and stable. The keyboard, like the rest of the system, was very well built. The cassette interface can run at 300 or 1,200 baud. Tapes distributed by RML are recorded normally at 300 baud as this reduces the possibility of a tape not loading correctly. RML says that users normally have no problems in using the interface at 1,200 baud. The system is controlled by the COS monitor, which is held in ROM on the processor board. There is a text editor, assembler, three versions of Basic and a number of diagnostic programs. The documentation supplied was in a single ring binder and although we managed to find out everything we wanted to know, it was difficult to find any particular piece of information. The COS monitor, developed by RML, provides the usual functions of program loading and dumping, starting programs, and debugging aids. There is a front-panel mode which displays the contents of the registers and a selected portion of memory on the screen. To the first-time user this will be very confusing but in a teaching environment, or for an experienced user, it is a very powerful aid. COS documentation includes a full source listing and a description of the subroutines which are available to the assembler programmer. The text editor and assembler were developed by RML. We did not have time to use them but from the documentation they appear more than adequate. 12K Basic; as 9K Basic but, without graphics, with extended precision arithmetic (12 significant figures), PRINT USING, and a number of other extensions. Documentation on the Basics is very sketchy. On the whole it assumes that the reader is already an experienced Basic programmer. It is also confusing in that the description of 12K Basic refers to 8K Basic (what is that?). Both the 9K and 12K Basics are based on TDL Basic. We had no problems using them and they appear to be reasonably fast. One disadvantage is that there is no syntax checking as statements are entered and the run-time error messages are not very explicit. RML announced recently two floppy disc systems which will be available shortly. They are the MDS, with mini floppies giving 80K bytes per drive, and FDS double-sided, full-size discs giving 500K bytes per drive. The FDS will be upgradable to double-density some time during 1979. 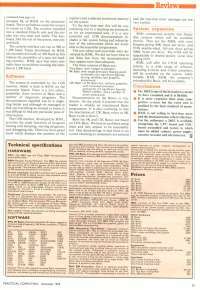 RML will offer the CP/M operating system, so a wide range of software, including Fortran and Cobol compilers, will be available on the system. Additionally RML XDB, the company’s extended disc Basic, will be available. The 380Z is one of the best micro systems we have examined and it is British. It is more expensive than some competitive systems but the extra cost is justified by the high standard of manufacture. RML is not selling to first-time users and the documentation reflects this fact. For the enthusiast a 280Z is available comprising the CPU board and VDU board assembled and tested, to which must be added cabinet, power supply, cassette recorder and television set. CPU: The 380Z uses the Zilog Z80A microprocessor with a 4MHz clock. RAM (Random Access Memory): The 380Z has sockets and circuitry for two blocks of dynamic RAM. Each block can use either 4K or 16K bit devices. 4K and 16K blocks can be mixed. Thus the basic 380Z can be supplied with up to 32K socket on one of the circuit boards. Printer interfaces: The SIO-1 interface card is available to provide RS232 or 20mA current loop standard serial input output to serial peripherals. Input/output support: cassette I/O can be selected to be at 300 or 1,200 bits/second. Output to the VDU is at a speed equivalent to about 5,000 baud with automatic paging, which can be suppressed. Output routines are included for the SIO-1, 2 and 3 interfaces and for the Centronics Line Printers. Hard-copy: Three printers are available. The Centronics 701 is a 132-column dot matrix printer which uses ‘intelligent’ bi-directional printing to achieve a throughput of about 60cps. The Centronics 779 is an 80-column dot matrix printer with a throughput of about 30cps. The Trend 800 is a quiet, lightweight (11kg) printer with a 30cps throughput. It uses standard Teletype paper. Disc system: Floppy disc systems are being developed along with the requisite software. RML 9K Basic: Size approximately 9K bytes; suggested minimum size of memory, 16K bytes; precision 7 digits; floating point. General: This is a fast general-purpose Basic interpreter with floating point numbers, string-handling functions, graphics, re-numberin and line editing. Extensions support the 380Z graphics and allow the plotting of symbols, characters and numbers. Two versions are available, the larger including also the ability to read and write data files on cassette, utilising the RML cassette file system. RML 12K Basic: Size, approximately 12K bytes; suggested minimum size of memory, 20K bytes; precision 12 digits; floating point. General: This includes all the features of RML 9K Basic with additions. Lines may be formatted. AUTO line numbering. a RAM can follow every statement, MID$ can be used to insert a substring into an existing string. PRINT USING statement for formatted output—options, right-justified, numeric fields, decimal point alignment, floating £ sign, commas every three digits, string field specification. Hexadecimal constants. Substring search. Enhancement of user-defined functions (multi-line, recursive). Program loading under program control. COPY, EXCHANGE, CALL. The RML 12K Basic will be of use in business and scientific applications requiring features not found in the RML 9K Basic. Due to its 12 digit precision, however, RML 12K Basic is not as fast as the RML 9K Basic. Graphics commands will be added to 12K Basic in late 1978. RML 2K Tiny Basic: Suggested minimum size of memory, 4K bytes; precision: INTEGERS only. Range +32767 to -32767; commands, RUN, LIST, NEW, OLD, SAVE. Keywords: REMARK, LET, INPUT, PRINT, PLOT, IF, GOTO, GOSUB, RETURN, FOR, NEXT, STEP, GRAPH, TEST. General: This is a small, powerful, integer Basic adapted from Li-Chen Wang's Palo-Alto Tiny Basic for the 8080. The original 8080 code has been streamlined to use Z80 codes and graph plotting with 380Z VDU graphics has been added. This is a Tiny Basic for graphics, games and learning Basic programming. RML Interactive Text Editor: Suggested minimum size of memory, 8K: This is a character-orientate text editor comparable to text editors available on large mainframes. The editor responds to a command string which can include commands to locate, delete, type and insert characters and lines, and to move an internal pointer. A command string can be saved and executed as a Macro. In the interactive mode, normal editor operation is continued and uses four scrolling lines at the bottom of the console screen. Whenever a command string is terminated, text either side of the pointer is displayed immediately on the upper 20 lines of the screen. Portions of the command string can be repeated n times using brackets—brackets can be nexted up to eight levels. The editor also includes an immediate mode. General: A powerful text editor. RML Z80 Assembler: This is an absolute assembler using Zilog mnemonics and producing object code in either the industry-standard Intel format or the RML binary format. The assembler incorporates a number of special features to speed program development on cassette-based systems. Source text is copied into memory during the first pass: the second pass can be made using this stored copy, bypassing the relatively slow process of re-reading the source from cassette. Errors can be corrected using a co-resident editor which implements a subset of the commands available in the RML text editor. Larger programs can be assembled in stages in a similar manner, if desired, or in the normal line by line fashion. Utilities: Supplied free with all 380Z/280Z systems. Diagnostics, Memory, cassette. A 3K ROM Monitor is supplied as standard. The 380Z may be supplied without a keyboard. For cost of the 380Z without a keyboard, subtract £159 from the above prices. 280Z: Consists of the two PCBs used in the 380Z, assembled and tested. To complete a system the user will require a TV set, power supply, cassette recorder, keyboard and a case, if required. Specifications are otherwise as for the 380Z. Except where otherwise noted, this website by Paul Flo Williams is licensed under a Creative Commons Attribution 3.0 Unported License.